Lena loves snow. She is a little bit disappointed that it never snows in Barcelona and one of her dreams is to once visit Antarctica. She has only seen real snow once when she was one year old and she can't really remember that, so her love for snow probably has something to do with the Disney movie 'Frozen'. A few weeks ago it was snowing in The Netherlands, so to make up for the lack of snow in Barcelona I searched for some fun activities that had something to do with snow. On the Instagram site of @Ibelieveinmontessori I found a fun snowflake matching activity. With this activity you have to match big and tiny snowflake cards. 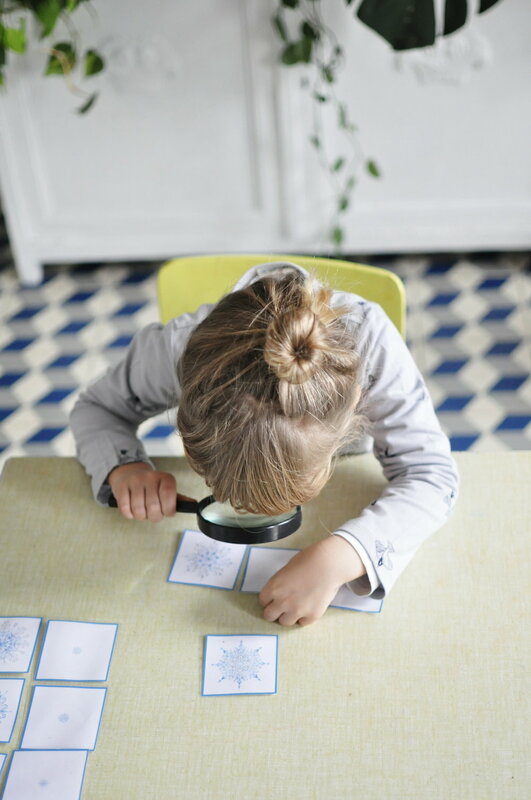 And what makes this activity extra fun, is that you have to use a magnifying glass to see the small snowflakes. Lena really loved this activity and she even brought it to school for show and tell so her classmates could try it out as well. P.s. The dress Lena is wearing is by Tiralahilacha.